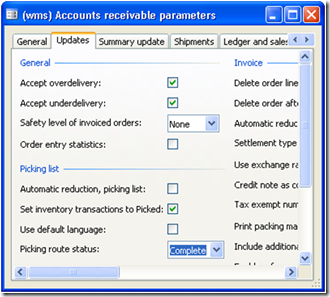 The purpose of this post is to present the major changes and new functionality that was introduced for sales and transfer order picking in AX 2009. The aim and the idea behind these changes is to move towards a single system for picking that can be shared in order to simplify and unify future extensions. Picking registration, as known in AX 4.0, is referred to as order picking. Picking with output orders and advanced WMS, as applied in AX 2009, is referred to as consolidated picking. The parameter Set inventory transactions to picked in AX 4.0 is now obsolete, and it has been replaced by the Picking route status parameter. The Picking list registration form is used to register what was picked and it is quite similar to the picking registration form in AX 4.0. You can either update the entire picking route or update individual lines, and you can view and pick both consolidated lines and order picking lines in this form. The End output inventory order parameter controls whether or not the reference between an output order and inventory transactions is removed when you delete or decrease the quantity of a picking registration line. 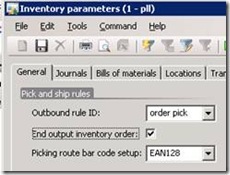 If the End output inventory order parameter is selected, the behavior is similar to the behavior in AX 4.0, and that is to say that after posting, the inventory transactions do not reference an output order. 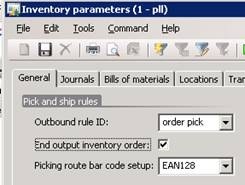 It the End output inventory order parameter is not selected, the reference between the output order and inventory transactions is not removed and a new picking route can be created from the Open output orders form. When the picking list is posted, the status of the picking lines and the inventory transactions changes. 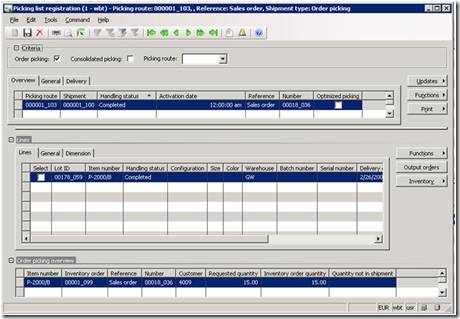 In AX 2009, there are no separate tables to store picking list journal and picking list registration data. 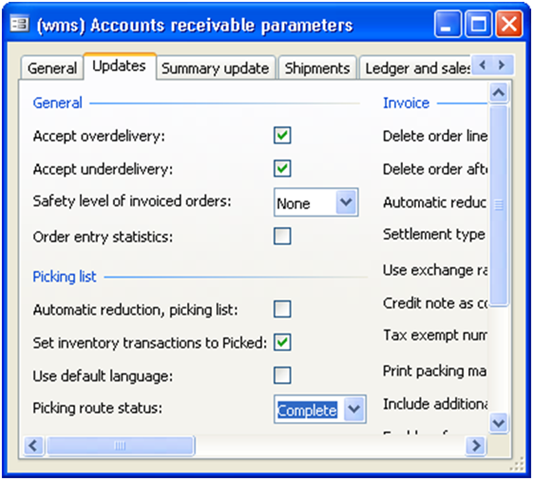 In AX 2009, picking is handled using the WMS module and several classes and tables prefixed with WMS are used. 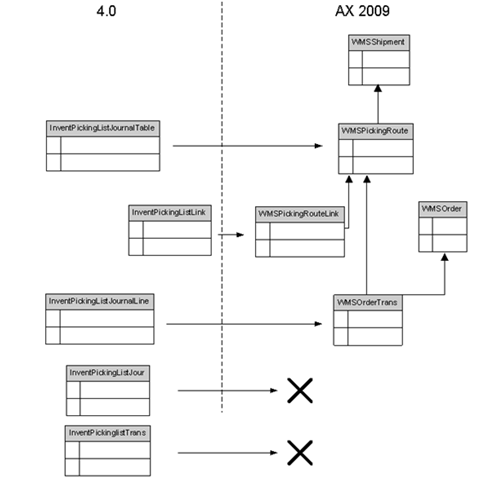 This means that several tables are controlled by the LogisticsAdvanced configuration key rather than by the WMSAdvanced configuration key as in AX 4.0. 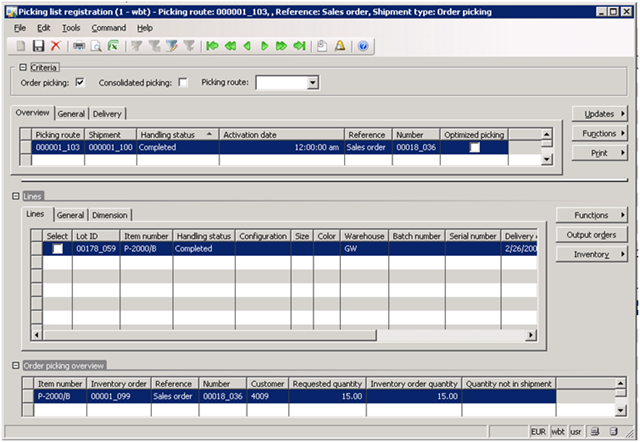 In AX 4.0, several classes were used when posting a picking list for transfer orders or sales orders. These classes are not directly replaced by new classes. The picking route is updated by calling the updateRoute method on the WMSPickingRoute table. The WMSOrderTransType class hierarchy is used for the actual pick of the line. A new class, WMSOrderTransType_Output_OrderPick, has been added, and this class is dedicated to order picking. The upgrade of the picking list data is handled by the createWMSPickingData script in the ReleaseUpdateDB41_Invent class. Only active picking lists for registration that are not yet picked are updated into the new tables. This post covers the changes to the order picking functionality. Hopefully we would cover more on this exiting functionality in our next posts. Keep watching. Per Lykke Lynnerup & Lennart Conrad, Inventory Management, Microsoft Dynamics Ax.